It's been a while since I done an outfit posts so thought it was time. I'm trying to get back into s routine with blogging as its so hard dealing with a full time job in retail which means you work silly hours and blogging enough to keep you guys interested! But I'm finally getting there! Now this isn't cowboy themed or it wasn't planned I promise! It just looks that way, my bad. This dress is very daring and I'm not keen on very revealing dresses! This is the sort of dress that is for a night out but I couldn't wear it without a jacket over because it's just too much. Maybe girls with a smaller chest it will be a bit better or if that's your sort of thing and you've got the confidence then hey ho and good on ya girl! I'd be just too aware and concious of a nip slip! Saying that though, I really enjoy the dress. The bottom of it is so fun and the straps are cross over which creates a nice back. The top half is silk type material which makes it look good quality. It also comes in a black version! 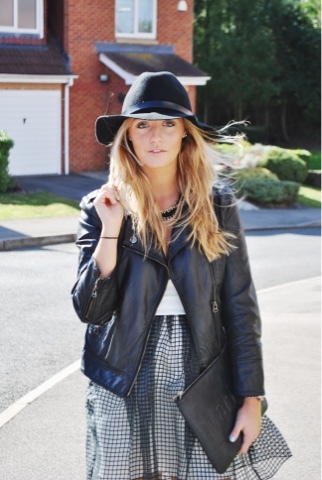 So I teamed this with a good old leather jacket which never fails to let us down! Also I'm loving these Primark boots, but they don't actually look that nice in these photos. I think it's because I'm not used to that height of the heel, I'm either wearing high heels or flats. The clutch is from these cute guys at Marlee and Fee* which is a bit of a Zara dupe! It's a great size as it fits all the essentials for a night out: camera, phone, purse, Lippy and of course a bronzer. you look gorgeous! The dress is amazing! Gorgeous outfit, I have seriously hair envy, very Serena VDW! Love the outfit, and your hair looks amazing!